Coaching is all about taking action, and often you (the client) are able to identify at least a few things that need to happen, and pick one or two to start working on before the next session. Sometimes, however, it’s hard to come up with a next action. Maybe you have tried the only thing you thought you could try and it didn’t work. Or perhaps you believe that you can’t do anything until someone else does something first. Or perhaps you know what you want to achieve, and want to maximise your chances of having massive success. In this situation, it might be useful to explore who could help you reach your goal or outcome. An Impact Map is a tool that’s very popular in the world of software development. It starts with a goal - the why - in the centre, and explores who can help you reach that goal, how they can help or hinder your progress towards the goal, and what you can do to encourage (or discourage) them. It very quickly generates a list of possible actions, which can then be prioritised. For example, let’s say your (SMART) goal is to lose 10kg in 20 weeks. The first step would be to map out a list of people (or organisations) who could help or hinder you in reaching that goal. For example, ‘Personal Trainer’, ‘my friend Mary’, ‘Mum’ as well as ‘Me’ (in reality there are many people who can help us reach our goals). The next step is to identify their natural behaviours - the how - that could help or hinder you. You might enjoy running and weight lifting. But you also enjoy food. A Personal Trainer can offer training. But they might be only available in the morning. Your friend Mary might be a regular runner. But she might live some distance away. Mum might be a supporter. But she might also be worried that you’re not eating enough, and be upset if you don’t eat everything she puts in front of you. The final step is to identify what you can do to encourage or discourage those behaviours. You can encourage a PT to offer you training by finding a PT that’s right for you and saving up so you have afford enough sessions. You could encourage Mary to go running with you by finding a running route you could both follow together. You could encourage Mum in supporting you by giving her a regular progress update. But you could reduce the chance of Mum getting upset when you don’t eat everything by explaining your goal, taking her out to lunch (at a place where you can control what you eat) etc. Then all you need to do is prioritise which things you will do next. And if they don’t work, you can try some of the other actions. If you’re waiting for someone else, you can continue to try things that don’t involve them. After all, the key to feeling as if you’re making progress is to make progress! 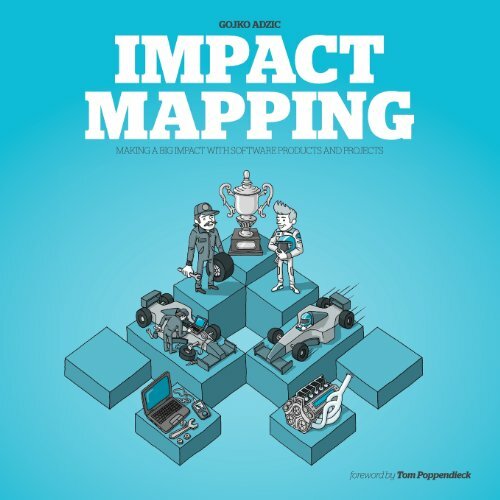 If you’d like to learn more about Impact Mapping as a tool for software delivery then I’d recommend reading the book. If you’d like to use it in a coaching session, get in touch and we can spend an hour together mapping out what you can do to help other people help you achieve your goal.